What is the Virtual Terminal? 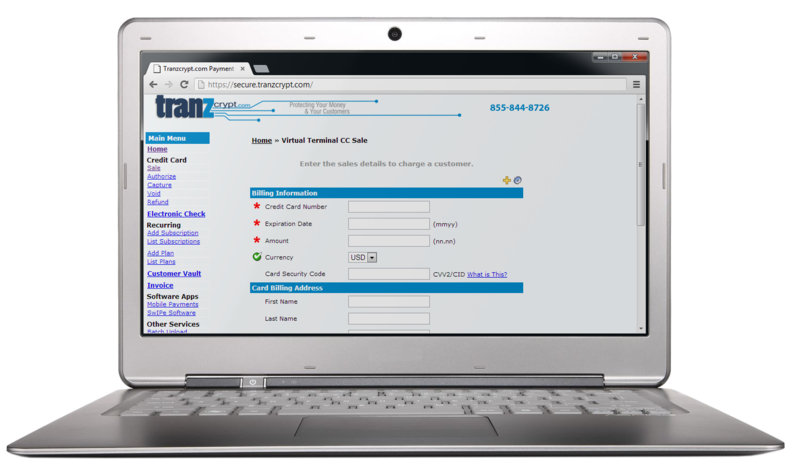 The Virtual Terminal is a standard feature within the Tranzcrypt.com Payment Gateway that allows anyone in the world with a log in to key in and run a credit card, debit card, or electronic check transaction in real time. The Virtual Terminal is the most important tool for most Mail Order Telephone Order (MOTO) merchants and allows them to take payment over the phone and key that card info directly into the gateway instead of a traditional credit card machine. The Virtual Terminal allows for real time form field validation, helping to eliminate key-entry errors by highlighting invalid fields and providing positive reinforcement for valid entries. The Virtual Terminal has the ability to use encrypted card readers, allowing merchants to accept card present transactions. This lowers the risk of fraud and allows merchants to receive discounted processing rates. Also available is our popular encrypted combination card swipe and key entry devices. Virtual Terminal also gives you the ability to have a check scanning device. Check scanners provide a fast and efficient way for merchants to process multiple checks and avoid costly mistakes associated with typographical errors. While using the Virtual Terminal, merchants may elect to save sensitive customer data in the Customer Vault for future billing purposes.